This little car-d is intended to lift the flagging spirits of some elderly friends who have just moved! The poor things are mentally and physically exhausted and full of aches and pains, so I chose yellow as the focal colour - I always think it's soothing and cheerful. 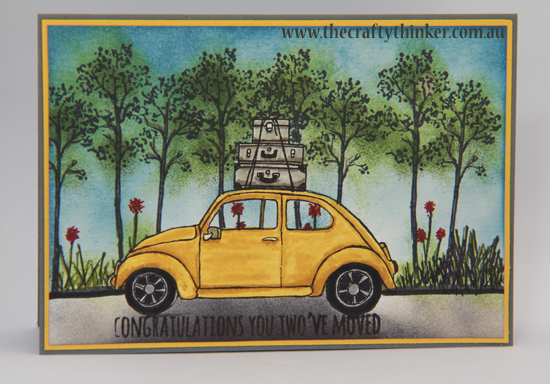 I stamped the car and luggage then masked them (having first removed the windows from the car mask) while I stamped the trees and shrubs then sponged the background. The shrubs are created with the grass stamp from the In the meadow stamp set. The road is sponged with Sahara Sand with shadows of a very light touch of black. The sky is Marina Mist and the trees and shrubs a mix of Pear Pizzazz and Mossy Meadow. Having removed the masks, I edged the road with Basic Gray and Basic Black markers. I coloured the car with Daffodil Delight and Crushed Curry markers. I used Basic Black, Basic Gray and Smoky Slate markers on the wheels. I added a little bit of Basic Black marker on the road under the tyres to "ground" the car. I coloured the tree trunks with Crumb cake and Chocolate Chip markers and added a few dots and strokes of Real Red marker to create some flowers. The luggage is coloured with Sahara Sand and Basic Black markers. I stamped the sentiment "Congratulations you two" and then added the "'ve moved" by partially inking the "We've moved" greeting. To ensure that it all looked even, I also inked the first sentiment with the Basic Black marker.